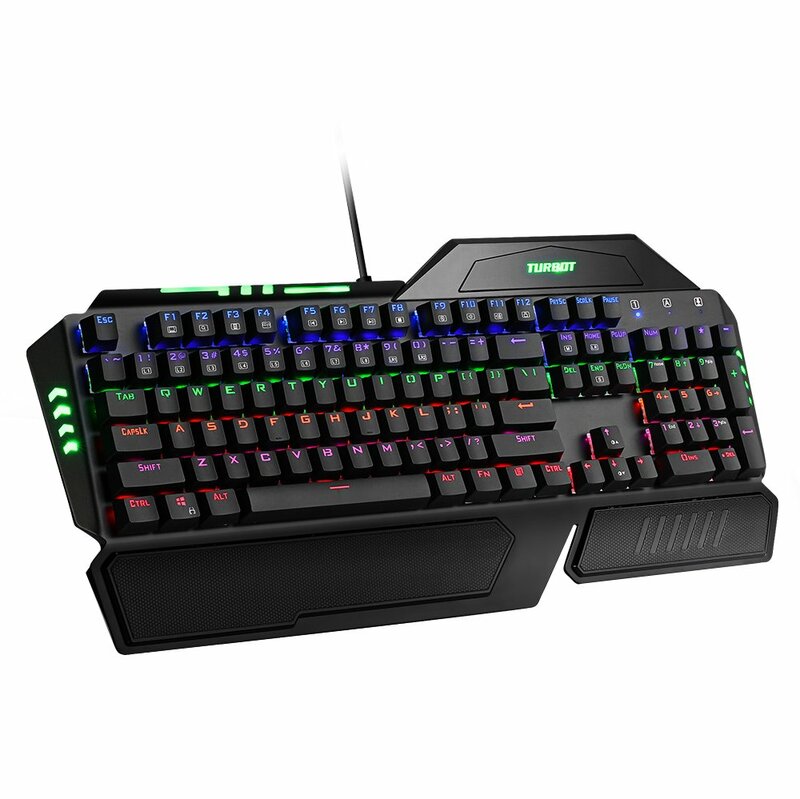 Home › Electronics › Turbot Backlit Water-Resistant 104-Key Wired Mechanical Gaming Keyboard For P..
Turbot Backlit Water-Resistant 104-Key Wired Mechanical Gaming Keyboard For P..
FULL ANTI-GHOSTING: Each key is controlled by a separate switch. It ensures that every key you press registers simultaneously and accurately in game. MULTIPLE BACKLIT MODES: Support 9 backlighting patterns. The color brightness and changing speed can also be adjusted by shortcuts. You can customize the specific backlighting color to your personal preference. INSTANTANEOUS RESPONSIVENESS: Blue switches are designed for longevity, responsiveness and durability. Each key delivers a distinctive tactile feedback to your fingertips and gives you a feeling of assurance that your command is being executed exactly. ERGONOMICS KEYCAPS AND WRIST REST: The gaming keyboard is mold to the shape of your hand, ensures that your fingers are always in the perfect position. Designed with a wrist rest, you can comfortably position your hands as you like. ECO-FRIENDLY MATERIAL: Double-shot injection molded keycaps ensure that characters will never fade. With the aluminum base and frosted surface design, the mechanical keyboard offers both comfortable touch feeling and visual elegance for everyday using. Exclusive Blue Switches Designed with blue switches, Turbot pc gaming keyboard has keys that deliver adistinctive tactile feedback to your fingertips in the form of pronouncedtaps. The computer gaming keyboard gives gamers a feeling of assurance thattheir commands are being executed exactly. As soon as you hit a key, it'll beexecuted as a command on the screen. Enemies are downed even before they canreact! The durability of each switch is up to 50 million keystrokes. So youcan count on perfectly executed commands every time. Anti-ghosting 104 Keys Allow multi-keys to work simultaneously. Each key was controlled by anindependent switch, ensuring a gaming-grade responsiveness with high speed. Customizable LED Illumination Use FN combined with different keys to select and personalize your backlitmodes. The Turbot gaming keyboards also give you control of adjusting thecolor brightness and changing speed to match your preference. Absolute Comfort With the ergonomics keycaps design, you can naturally position your fingers.The wrist rest ensure that you are in a comfortable position whether typing orgaming, not easily get fatigue. Key Cap Puller With a key cap puller, you can pull your key caps easily when cleaning orchanging the key caps. Perfect Compatibility The game keyboard is compatible with Windows10, Windows 8, Windows 7, Mac OSX, Windows XP, Windows VISTA. Warranty Every Turbot keyboard for gaming includes a 45 days money back & 18-monthworry-free guarantee!